A winning publishing strategy on social media requires more than great content. Timing and execution also play a critical role. What’s more, without the right tools to effectively plan, organize and manage your social campaigns, even the most creative and engaging posts can fall flat. Luckily, Sprout Social’s publishing suite can help. Today, we’re excited to announce the all-new publishing calendar: a beautifully designed weekly view that joins with Sprout’s existing team publishing tools to make it even easier to collaborate on content campaigns across multiple profiles and networks. 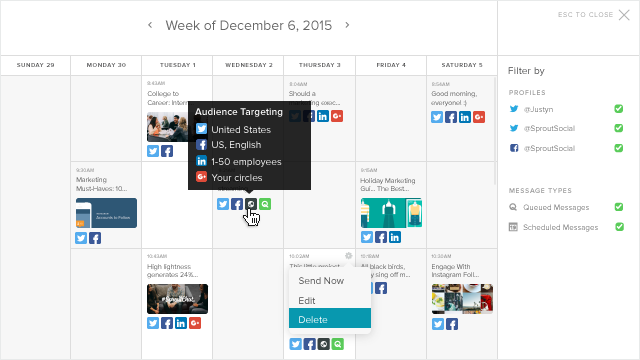 The new publishing calendar brings efficiency and consistency to your team’s publishing efforts. 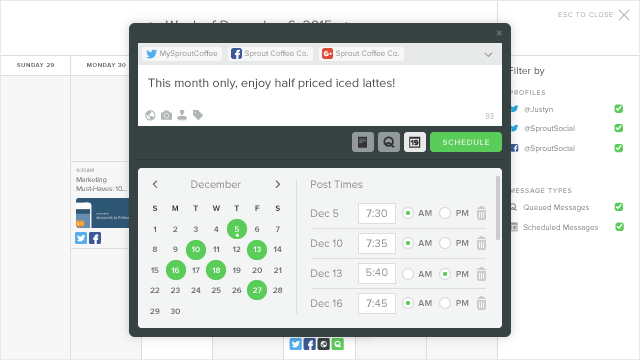 You can easily view and manage a full week’s worth of social posts across multiple profiles and networks all in one place. To launch the new weekly view, click Calendar in Publishing > Scheduled, located both at the bottom of the left-side navigation and below the monthly calendar on the right bar. Clicking any post on the calendar will open it in Compose, enabling you to make any necessary edits. To add a new post, click on an open space, and a new Compose window will appear. You can easily jump between weeks, using the arrows next to the date at the top of the calendar. Depending on your publishing strategy and the number of profiles you are managing, your calendar can quickly start to fill up. A weekly visualization of your social posts across profiles and networks is a great way to ensure a well-rounded social program. To streamline the content management process, we’ve designed the calendar layout to be responsive to the scheduled content within that week. The time range of the calendar will start on the hour of that week’s earliest scheduled post. All other messages will stack up vertically and show a relative distribution across all seven days. When scheduling the same message to publish on multiple dates, each instance of the post will appear on the calendar in its respective date and time. Also, filtering the calendar by profile is a great way to quickly identify publishing gaps. For example, maybe you’re a bit too Twitter heavy this week and need a few more Facebook posts. Filtering the calendar can expose these gaps in your publishing strategy so you can easily make edits to the existing schedule and add new content where needed. While understanding how your content lays out over the course of a week is important to your overall social program, it’s also helpful to dig in more granularly. Scheduled posts that include photos or links will display thumbnail images and metadata, respectively. Meanwhile, visual icons and hover states enable you to see full details for each of your scheduled posts right from the calendar—including audience targeting by network, approval status (Advanced plan only) and all profiles and networks to which the message will be published. As we’ve detailed on Insights before, reposting messages and spreading posts across multiple dates and times is an effective way to get more mileage out of your social content. Whether promoting a campaign or filling your publishing calendar, having the proper tools to plan, organize and manage your posts is imperative to executing a winning social strategy. 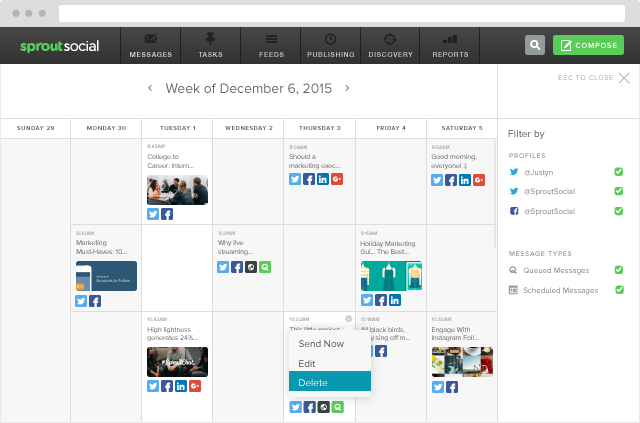 Stay tuned for more updates to Sprout’s publishing tools, including enhancements to the new publishing calendar. And as always, let us know if you have any questions or feedback.